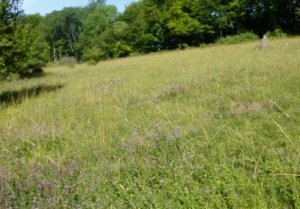 Alpine Meadow is a fine piece of chalk grassland in a wooded valley within the unspoilt Ashridge Woodlands. This chalk grassland is rich in wildflowers and butterflies from spring to autumn. Primroses flourish around the woodland edge in spring and, later on, mouse-ear hawkweed, fairy flax and common spotted orchids can be seen. The warm sloping grassland attracts many insects in the summer, including the marbled white butterfly which is uncommon in Hertfordshire. The woodland to the south of the meadow supports birds such as green woodpeckers, finches and goldcrests which can be seen busily feeding in the winter months.